How Do We Know About Dinosaurs? Everything we know about Dinosaurs comes from scientific evidence. That means the real, physical remains of the animals that have been preserved in the world’s deserts, river beds, and cliffs for millions and millions of years. 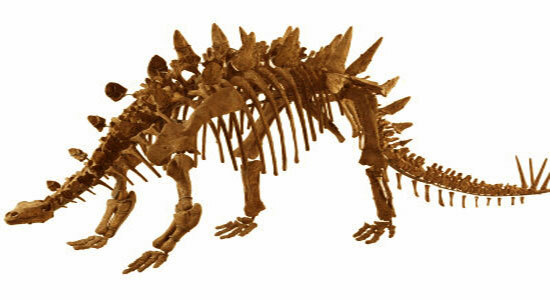 It was not until the 19th century that the remains were correctly identified, and the science of palaeontology was born. Since then, amazing discoveries have been made worldwide, including this complete skeleton of Coelophysis, unearthed in the sands of Texas, USA. A fossil is the preserved remains of a plant or animal. These remains can be either hardened bones, shells, or other parts, or a preserved impression of the hard parts. 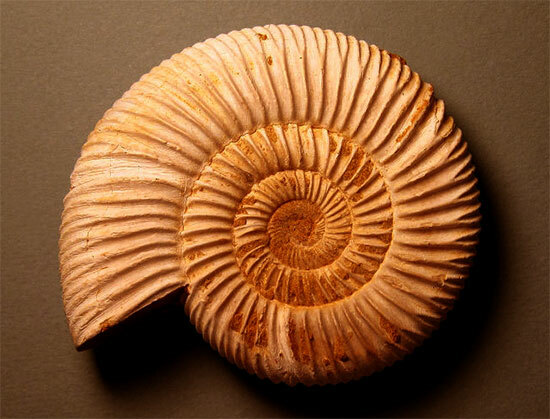 One of the most common fossils is an ammonite – a shelled sea creature that lived at the same time as the dinosaurs. When dinosaurs were first identified? People have been collecting dinosaur fossils for many years, but it was not until 1842 that dinosaurs were recognized as a distinct group of animals. 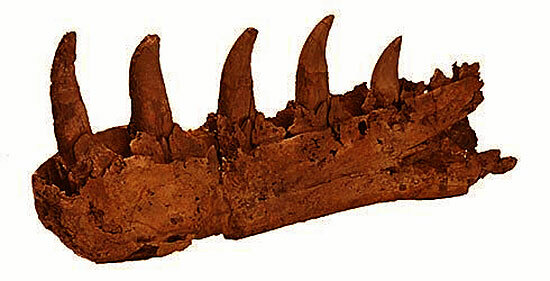 When this jaw was found in England, experts realized that this, and other remains, belonged to extinct giant reptiles. Soon the term “dinosaur” was used to describe them. Palaeontologists are those scientists who study fossils. They work both at the world’s fossil sites, excavating fossils, and in the laboratory, cleaning and analyzing fossils. Here, a palaeontologist treats a sauropod bone before moving it from the Sahara desert. Dinosaur bones are easily uncovered in the desert sands without the need to dig deep. How is a dinosaur skeleton made? People often think that dinosaur skeletons in museums are real, but they are usually replicas. Palaeontologists create a complete skeleton from synthetic bones, using a few fossilized bones and skeletons of dinosaur relatives as a guide. Some skeletons are made from a mix of fossilized and synthetic bones. Many dinosaurs are named after a distinguishing feature. 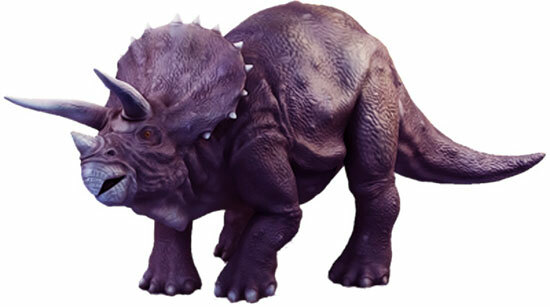 For example, Triceratops means “three-horned face”. Some are named because of where they were found – Argentinosaurus is a “reptile of Argentina”. Others are called after the person who discovered them: Herrerasaurus means “Herrera’s reptile”. Fossils are formed by a process called mineralization. A creature dies and its soft parts rot away, leaving the skeleton. Minerals from water seep into the bones. The minerals eventually solidify, turning the bones into stone. Dinosaur fossils are often found in river beds, where the bodies have been quickly covered in sand and mud. A dinosaur is chased into a slow-flowing river, where it drowns and sinks into the mud. The soft tissues rot away, but the skeleton of the dinosaur stays more or less intact. Millions of years later the ancient landscape has been buried, and new types of animals have evolved. 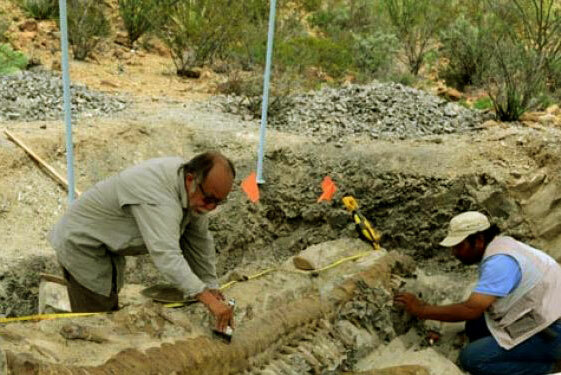 Surface erosion exposes the fossilized bones, which can then be excavated by fossils experts.